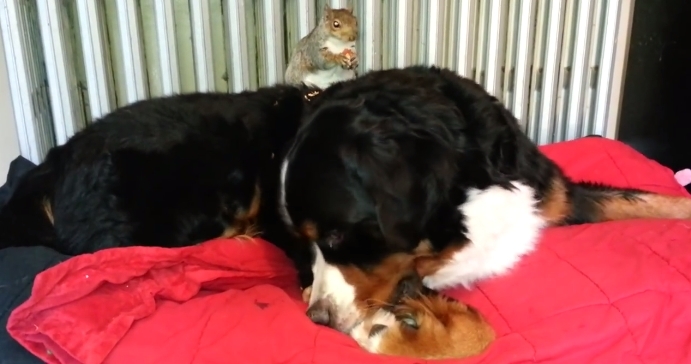 Wally the pet squirrel likes to hang out with his friend Jax, the Bernese Mountain Dog. In fact he’s so comfortable with his pal he eats his almonds on top of him. Squirrels as a rule are vegetarians by heart. Some species, however, will feed on insects. Their diet in natural surroundings will be varied depending on the environment that they are in. Pet squirrels can be fed a similar diet in captivity. The main diet of squirrels is: nuts, seeds, fruits, lichens, buds, mushrooms, roots, pine cones, leaves, twigs, bark, black walnuts, oranges, avocados, apples, apricots. One of their favorites is definitely corn on the cob that is dried and hung up for them. Responses to "Squirrel likes to eat his nuts on top of Bernese Mountain Dog (VIDEO)"